The grim futurist vision in Orwell’s famous novel would seem not to have come to pass. Even though, thirty years further on from the titular date, we still have not suffered the dystopia he envisaged, the book remains a potent and influential text. Orwell’s novel reflected a host of influences: his early life and preparatory school: his experience of the depression in the 1930s: his experience of sectarianism, the suppression of anarcho-syndicalist organisations in Barcelona in 1937: his experience of the destruction and scarcity of the war years: his time at the BBC and his experience of its bureaucracy: his readings and knowledge of events both in the Soviet Union of the 1930s, including Arthur Koestler’s ‘Darkness at Noon’ (1940), and of the Fascist dictatorships in the 1920s and 1930s: and writing the novel in the post-war world of rationing and the ‘cold war’. There is also the influence of the earlier novel by Aldous Huxley, Brave New World (1931), though this book relies on hedonistic addiction rather than brutal surveillance. A stronger influence would be the Soviet novel We (Мы) a dystopian story by Yevgeny Zamyatin completed in 1921. There are many plot cross-overs though Yevgeny’s novel is set farther in the future in an advanced technological society. Orwell’s vision is bleak and pessimistic. He subscribes to the notion of a totalitarian state. And as is common with that concept he elides the political economy of his society. Whilst it offers some version of socialism it also appears to operate under a system of commodity production and exchange. The book has been adapted into plays, radio plays [including ‘The Goons’], for television [including the trivial Room 101]; into an opera and even a ballet; the last impressed me more than I expected. Predictably there are also television and film feature length versions: some attempt a literal translation others involve influence or reformulation. 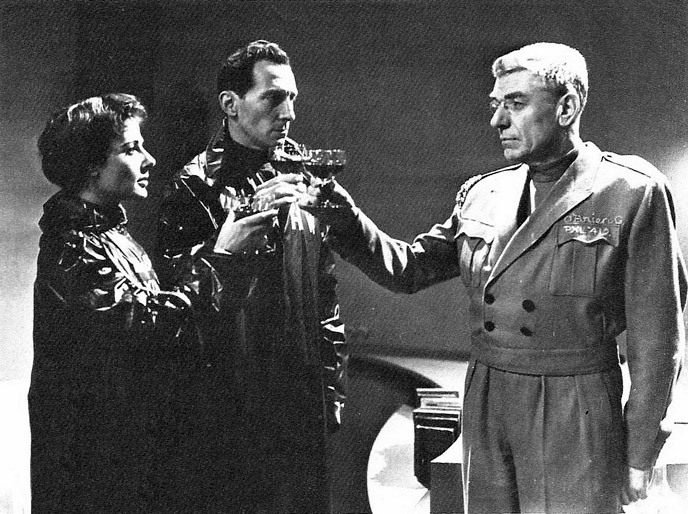 The BBC broadcast an adaption in 1954: CBS had already broadcast a US Network version in 1953. 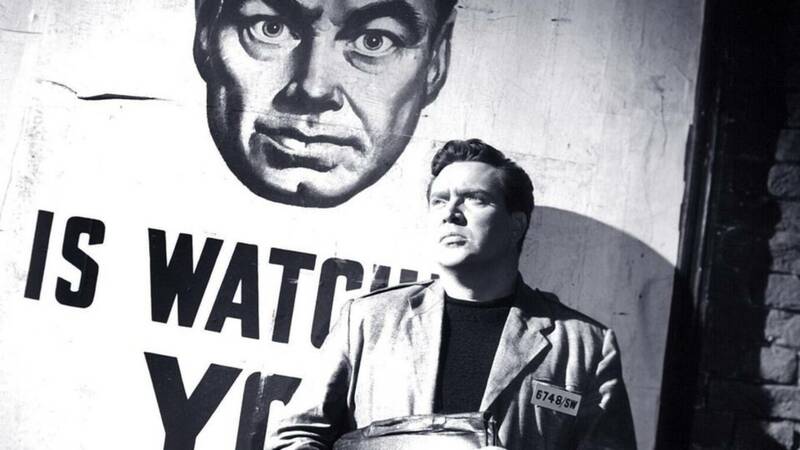 The BBC production was written by Nigel Kneale, a key figure in television science fiction. It was directed by Rudolph Cartier who was a seminal figure in early British television drama. The production was recorded in a studio with filmed inserts. The dominance of close-ups and fairly bare television sets works to generate a real sense of paranoia appropriate to the book. This version closely follows the book though some sections are elided, as for example with the exterior sequences in the ‘prole’ area. We do get the INGSOC slogans, examples of Newspeak and references to the critical work of Emmanuel Goldstein. However, the long analysis in Orwell’s book from this source is missing. The film does essay the brutal interrogations inflicted by O’Brien and the final defeatist sequence. Peter Cushing as Winston and André Morell as O’Brien stand out in a strong cast. 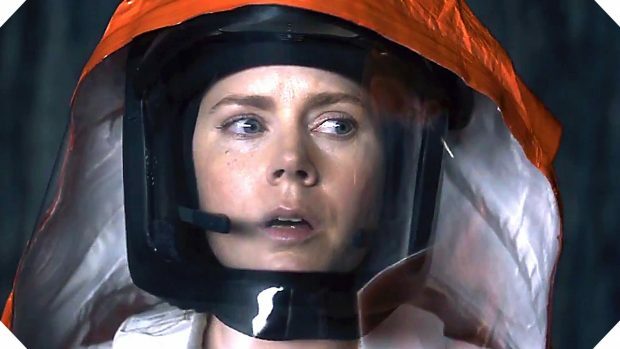 “It seems that the BBC flap prompted Columbia Pictures, the distributors, to shoot two endings, one faithful to the novel and the other more hopeful.” (Tony Shaw, 2006). Similar influences lay behind the 1954 adaptation of Orwell’s other dystopian fable, Animal Farm. The animation by Joy Batchelor and John Halas is excellent but the film strays from Orwell’s original in ways that parallel the Holiday Film 1984. There are also several television films of this novel. I did wonder if the CBS television version of ‘Nineteen Eighty-Four’ had a similar provenance. The film was scripted by Michael Radford with added material by Jonathan Gems and directed by Michael Radford. The two key characters are John Hurt as Winston and Richard Burton as O’Brien. Hurt is aptly cast, Burton never quite achieves O’Brien’s Machiavellian persona. But the major problem is the scripting. The film emphasizes the subjective viewpoint of Winston Smith. Some of this, like the diary with an internal voice, is very effective, as are flashbacks to Winston’s childhood. The book’s analysis is only briefly presented. At one point Winston reads to Julia from Goldstein’s book the passage about war, but little else. Oddly when Winston visits O’Brien [alone] the latter is not explicit about claiming to be part of the undergrounds. Even more oddly there are a series of ‘dream’ sequences which involve a door marked ‘101’ opening onto a green but artificial landscape bathed in sunlight. At various points the landscape includes Winston, Winston and Julia, Winston and O’Brien and all three: plus one shot where it is empty. Room 1001 is one of the memorable inventions in Orwell’s book, the site of the ultimate torture and mind-bending experience. But what exactly these ‘dream’ sequences’ were meant to suggest is not really resolved though they obviously provide an opposition to the actual Room 101 and stress Winston’s subjective stance. Perhaps they relate to the final ambiguous shot of Winston, face screwed up, mumbling ‘I love Big Brother’. The sound and vision of the film is effective. The production design presents a sort of grunge war-time Britain. This is shot with great skill by Roger Deakins, director of photography and camera operator. And the Eastman film stock received special processing to achieve the desaturated look. But the story within this feels rather hollow and never achieves the grim dystopian feel of the book. It is also a capitalist society based on commodity production. 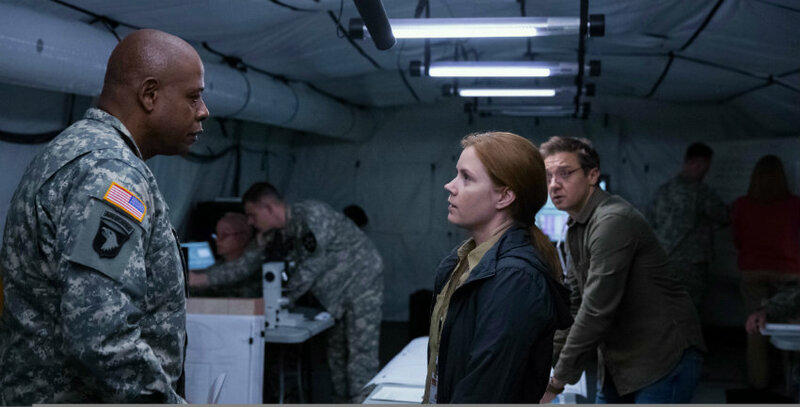 This film has the familiar look of Gilliam’s style: I was especially taken with a automated surveillance machine that acted rather like an eager puppy. There is a brief visual reference to Potemkin, [playing with the 1956 version?] Like its immediate predecessor, and typical of Gilliam’s work, the film offers a series of fantasy/dreams. These offer alternative romantic and upbeat sequences to the dystopian world. And, unlike the preceding Ninety Eighty-Four, they come together at the conclusion to offer resolution between the subjective and objective worlds in the film. That conclusion plays intriguingly with that in Orwell’s novel. 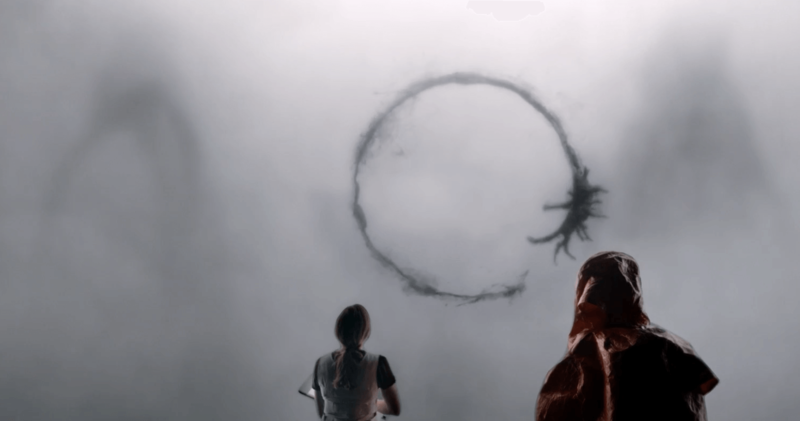 The film repeatedly offers sequences that are as brutal and downbeat as the novel. 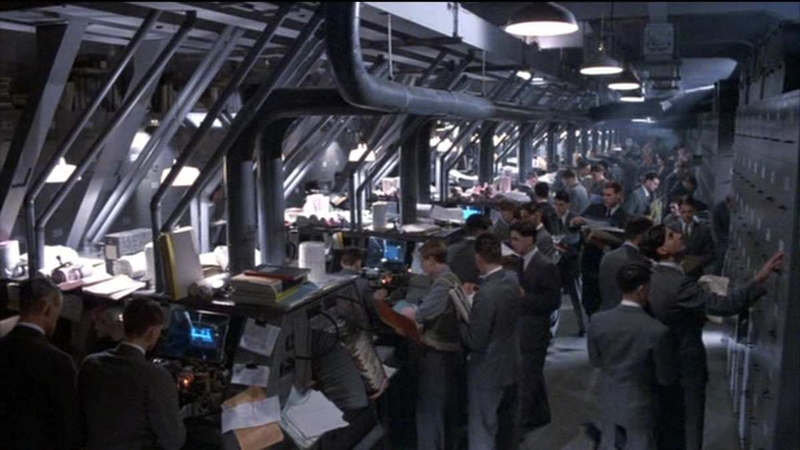 And, like Orwell, Gilliam and his team come up with original and distinctive images and motifs. Hapless victims are trussed in metal tagged sacks for torture. The site of this is Room 5001. But the ‘brainwashed’ or ‘unthinking populace’ are not central except in the brutally realistic terrorist acts. A slightly earlier science fiction film is an example of influence rather than transposition, Blade Runner (1982). We have replicants instead of proles or perpetrators of ‘thought crime’. But we do have the intrusive surveillance in what is clearly another dystopia. And the impressive design of this film also harks back to Orwell. “The Ministry of Truth … was startlingly different from other objects in sight. It was an enormous pyramidal structure of glittering white concrete, soaring up, terrace after terrace, three hundred meters into the air.” (‘Nineteen Eighty-Four’, Orwell). Intriguingly the original release version also contained the much criticised flight by Rick Deckard (Harrison Ford) and Rachael (Sean Young) from the city to a green landscape. This parallels the setting presented [dreamlike] at the end of Brazil and it is similar to the dreams of Hurt’s character, Winston, in his subjective version of Room 101. In the book green countryside is the site of Winston’s and Julia’s first tryst and initial sexual acts. Otherwise Orwell’s book is resolutely urban, conjuring up the traditional opposition between the urban and the rural that is a central trope in traditional melodrama. That is also a trope in another dystopian film, Logan’s Run (1976): though that film seems to be more influenced by Huxley’s ‘Brave New World’. That would also be true of the far better science fiction film Gattaca (1997). Fahrenheit 451 (1966) is probably influenced by both but the idea of firemen who burn books and an underground dedicated to memorising forbidden texts appears to be a riposte by the original author Ray Bradbury to Orwell. There are indeed many other films that offer examples of the influence of Orwell’s classic. Dark City (1998) has another dystopia, somewhat removed from the world described by Orwell, but whose hero suffers the problem of rediscovering the actual past whilst an underworld power controls to a degree how people perceive. This is one among a number of suggestions on the Web by fans of the novel and its numerous re-interpretations. 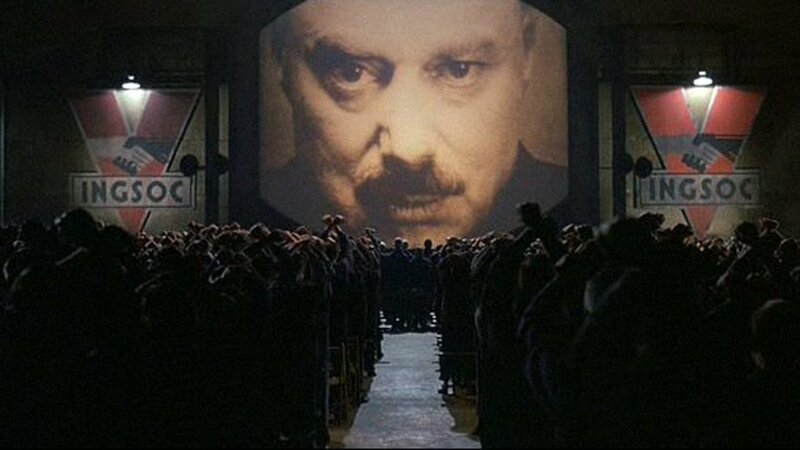 Robert Harris, the novelist, regards ‘Nineteen Eighty-Four’ as the most influential novel in modern writing. His books reflect this, as do film versions such as Fatherland (1994) and his screenplay for The Ghost Writer (2010). ‘Romantic’ new version of 1984 planned with Kristen Stewart’ (Yahoo Movies in 2016). seems to have fallen by the wayside. It is a sign of how Orwell’s nightmare vision has gripped the popular imagination that artists continually return to his classic novel. It seems that ‘Big Brother’ and ‘Room 101’ will be with us for many years to come. 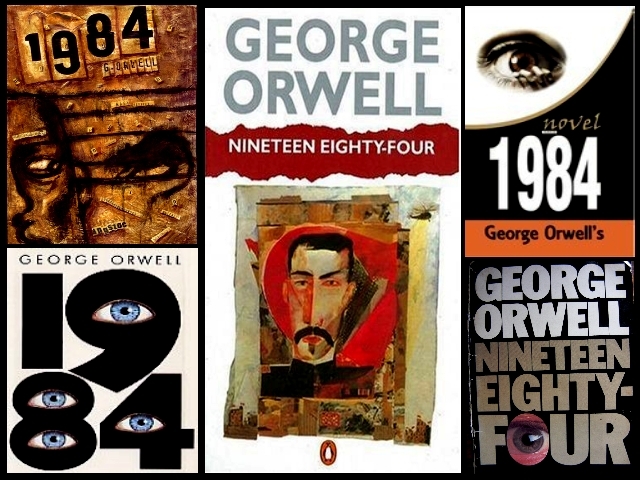 There are many articles and books and Web postings on Orwell and ‘1984’. Especially useful for Film Studies is Tony Shaw, 2006 – British Cinema and the Cold War The State, Propaganda and Consensus, I. B. Tauris, London and New York. This article was originally written for the Media Education Journal, Issue 60, which celebrated the magazine which first appeared in 1984. It seemed a nice touch to write about Orwell’s now famous year.